Providing you the best range of circular woven fabrics, coated and uncoated (narrow width) and circular woven fabrics with effective & timely delivery. 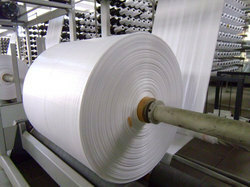 Circular and Flat fabrics are manufactured on world class circular looms and tapes lines. Our range of fabrics have woven edges & reinforced stripes and can also have colored markings for identification of product type. UV stabilization is an essential feature of these fabrics. Stringent quality checks of our team of quality auditors, ensures flawless range of PP fabrics at cost effective prices. Circular fabrics are used for coating of tandem lamination plant and flat fabrics find utility for covering flat lamination plant etc. UV Stabilization As per customer requirement.